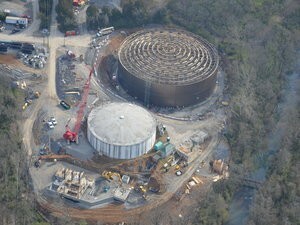 Dodson Chapel Pumping Station Expansion, Nashville, TN Design and renovation of the waste water treatment plant. Work included structural design for two 4.5 million gallon reinforced precast concrete, partially buried equalization basins and two new concrete framed pump stations- a 17 MGD dry weather pump station (replacing an existing facility) along with another wet weather pump station. Lpe designed structural modifications and enhancements to the existing raw water facility. The modifications included new stairs, walls and concrete slabs. Enhancements and modifications to the existing water treatment facility. Structural modifications included demolition and replacement of concrete baffles, walkways and concrete columns. New weirs and effluent flumes were also designed as part of the scope. LPe provided structural additions to the existing Administration building. The structure consisted of an approximately 3000 square foot new concrete frame building with storage capacity. Also included in the scope were modifications and repairs of the existing facility. Work on the project involved structural modifications, renovations and additions to the existing WWTP facility. Additions included a new 7000 square foot steel structure frame with overhead crane. Structural modifications included new concrete chambers, walkways, steel framed gradings and new electrical facilities. The Waste Water Treatment Plant upgrade which iIncluded a new 1500 square foot storage facility with monorail, a sludge drying bed concrete facility, a 4000 gallon oil storage facility and a 10 foot tall retention pond wall with walkway. LPe is currently working on the design of a new concrete Fine Bar Screen Structure as part of this project. Design will include structural support for two monorails, a new retaining wall and concrete pavement between the wall and the building, as well as exterior concrete stairs and Pipe Bollard supports. Lpe is currently working on the design of a storage facility. The structure consists of load bearing masonry walls and pre-engineered wood trusses.